Unless you live the take-out life and have a drawer full of plastic utensils and disposable chop sticks–believe us, we get it–you probably have accrued a nice set of silverware and plates, the kind that can stain, rust, or shatter if not taken care of correctly. When moving is depicted in the movies or television, it usually involves a scene where someone drops a box full of ceramic or china plates, causing the viewer to cringe at that sound, which haunts professional movers in their sleep. We do offer our own packing services, which some people will order if they’re transporting mostly light but fragile items. After all, when it comes to packing plates and packing silverware, if they are packed well, then one could feasibly drop them from the top of a staircase and find them unscathed. Now, we in no way suggest you do this as a means to “test” the quality of your packing job, but it’s a nice thing to keep in mind while not relying on it. So without further ado, here is exactly what you need to know about packing silverware and packing plates when moving homes or apartments. As you may know, silverware can lose its shine through abrasion and tarnish from use and exposure to are. But improper care, storage, and packing can also do quite a bit of damage. It’s fair to say, dumping your silverware in a box and carrying that with no padding inside will mean that your silverware is not going to look like silverware once you take it out of the box again. So what are the best practices that our professionals use? First of all, investing in packing materials is always worth the investment because not only is it a small form of insurance against a box breaking or tearing, you’ll likely be able to break the boxes and supplies down and re-use them for a future move or other project. Corrugated boxes are the best choice because they feature an extra layer of padding built into the box, which increases the cost but also the level of protection so if you can, always got with corrugated when packing your dish box. Next up, wrap groups of silverwares in bundles and place them in an empty silverware tray. Wrap that tray in packing paper and be sure to mark which side is the top and which is the bottom. Both sides. Seriously. You might think just marking the top side would be obvious to others, but you would be wrong. It may have happened to us once or twice before…. You then just pack that tray in a box where you may have your plates and other kitchen items so that nothing gets separated and unpacking is a breeze. Remember that air can cause tarnishing in silverware, which is why it’s always kept in a drawer. Wrap the bundles of silverware in clean, unmarked paper and when it comes to knives, place each one in alternating directions and mark that bundle as “knives” to ensure no one gets accidentally hurt. Packing paper is truly the key to any successful and it’s almost hard to overdo a well-packed dish box. While getting excessive with paper wrapping can mean decreased space in boxes and thus more packing materials, if you want to decrease your anxiety about what may happen if a box gets dropped, then use as much packing paper as you feel fit. Wrap each plate individually, using at least one sheet of packing paper. 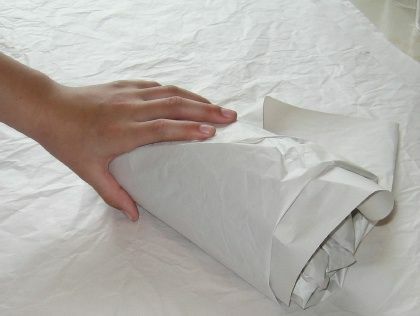 When wrapping, lay the plate near the corner of the sheet and wrap diagonally, tucking in the ends along the way. Then you can repeat this process as much you wish, though between one and three sheets usually do the trick. And make sure there is a layer of newspaper or packing papers crumpled up at the bottom of the box to provide added protection. When placing the plates in the box, set them on their side rather than packing them atop one another. Fill up the bottom layer of the box, lay down another row of crumpled paper and repeat the process. If you end up needing more than a single dish box, just make sure that you don’t mix your kitchen items with anything other items as it makes unpacking way simpler. And like that, you have our time-tested method for packing plates and packing silverware so use it wisely and move with the comfort of knowing that your dish boxes are as well-packed as they can possibly be.